One of my best friends is Chilean. I met her when I was fifteen and for over a year I spend a lot of time at her place. Of course because she was my friend, but the fact that her mum made great food was a huge bonus. The amount of beef empanadas we ate must have been huge. And with that stack of empanadas, were the bowls of pebre. How I loved that salsa! At my friends house, it was usually made with a mild variety of chili pepper, so it was never a problem to bury your food underneath a pile of the pebre. One time they had a barbecue and I was piling the pebre on top of a piece of baguette, as usual, when it turned out that not my friends mum, but a friend of hers had made the pebre. She hadn't used mild peppers, but brutally hot scotsch bonnets. My gluttony was severely punished, and it took me an hour to recover from the burning sensation in my mouth. When I make it myself, I use mild chili peppers or a jalapeño. Of course you can make this as hot as you like. A tablespoon of sweet hot chilisauce will work fine as well. 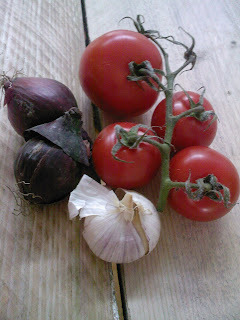 Coarsely chop the tomatoes and finely chop the onion, pepper and garlic. Mix with the chopped cilantro. Finish with a good drizzle of olive oil and a sprinkle of sea salt. This recipe makes about 2 cups of pebre, good enough for dinner for two. 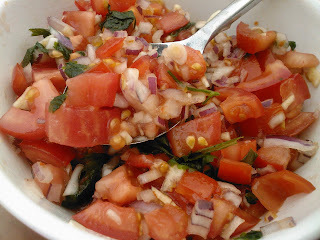 You can easily multiply this recipe to make this salsa for a larger group, but keep the ratios in this recipe. It makes a very tasty salsa.